Late winter and early spring are a great time to explore what the fishing can be like in the back country of Florida’s Lower Keys. There are usually a lot of days that the wind is a little brisk for moderate sized boats to comfortably ply the waters offshore or even on the reef line. Learning your way around the channels and basins of the Keys will open up a lot more opportunities and allow you to greatly increase your days on the water. There are many ways to effectively work the back country and as many different kinds of fish to target. 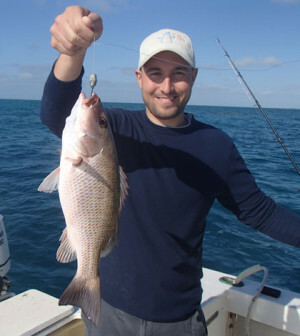 Snapper are a perennial favorite for Keys anglers. They are readily available and are hard to beat at the dinner table. Trout are another favorite and this year, for the first time in a long time there is no closed season. Other favorites are porgies, cobia, cero, Spanish and king mackerel. Bluefish, sharks and barracuda are also found. Of course now that the grouper season is closed for Monroe County anglers, there will be plenty of those for you to begrudgingly return to the water. There are three main ways to fish the back country not including the specialized flats fishing. Anchoring in the channels, anchoring around structure, and drifting the basins. With the first two techniques it takes plenty of chum to get the activity going and draw fish in from outside of your immediate area. With the last technique the goal is to cover ground by drifting to make sure that you get your bait in front of perspective customers. To find structure in the back country I recommend exploring the area that you are interested in on the really nice days. Yes you will have to miss out on the ocean side fishing on a few nice days, however structure such as coral heads, small wrecks and other items that can hold fish are going to be nearly impossible to find on the days that it is blowing twenty plus, and the water is already murky. You can always resort to sweet talking your experienced friends and neighbors with food and libations to coax the information from them. 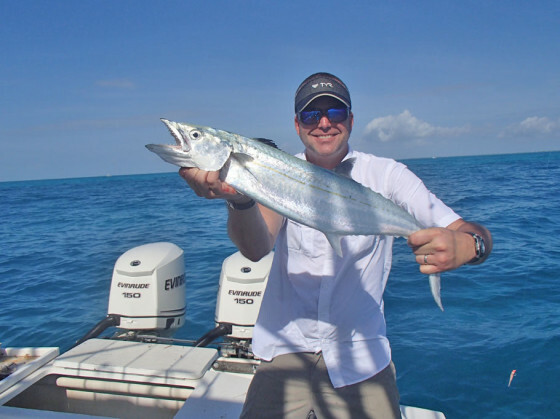 Finding fish in the channels of the Lower Keys is a little easier in that you are looking in a fixed area and you can simply cruise up and down the channel with your depth finder to find holes and ledges that hold fish. You should be able to mark the schools of fish or at least the bait fish holding over the holes. The channels do not have to be very deep if there is good water flow and a little cover for the fish to hunker down behind and ambush their prey. Some of my favorite channels are only about four or five feet deep at low tide. With any fishing where chum is deployed, the arrival of bait fish into the chum line is an opportunity that should not be ignored. Ballyhoo especially are a bait that will draw strikes from almost every fish you would want to encounter. Catching a bait well full of fresh bait can be as easy as tossing a cast net on the days that they cooperate by getting in range. On the days that they tend to stay farther back in your chum line than you can throw you will have to settle for catching them one at a time on hair hooks baited with tiny chunks of fish, shrimp or squid. Using them for both live and cut bait will increase the variety of fish you encounter. If you use them as cut bait I recommend that you use larger plugs. Cut only the tail fins and head off then divide the rest in two. Smaller pieces tend to draw strikes from bait sized fish including grunts and pinfish. The larger chunks will lie on the bottom and be picked on by the bait stealers drawing attention from the larger more wary fish. Cobia are a sucker for a large fresh chunk of ballyhoo. Rigging a live ballyhoo is best done using a trace of steel leader. The sharks and mackerels tend to home in on the struggling fish. A few inches of light single strand in front of the bait will suffice. Another trick is to rig a second hook known as a “ha ha” hook, as mackerel especially tend to strike short and will often leave you with a hooked head while they enjoy the rest of the hookless morsel. The last method is to drift the channels and basins. Most anglers prefer to use artificial lures when drifting. The jigs with both bucktails and plastic tails will work effectively. I tend to prefer the Gulp lures. I like the new penny color shaped like a shrimp. These scented lures tend to stand up to the incessant nibbling from the pinfish and tiny snapper found while drifting. The main fish that most anglers hope to encounter are trout however mangrove snapper and mackerel are also often encountered. Besides the channels and basins in general, one thing to specifically look for is the presence of mullet. There is often a tell tale area of muddy water stirred up by the bottom feeding fish. Fish like trout like to feed on the crabs, shrimp and small fish displaced by the feeding mullet. These muds can be as small as a few hundred feet long to tens of acres in size. The important thing to take from this is to not let a bit of wind stop you from enjoying the water. There is plenty of protection and fishing to be had between the islands of the Lower Keys.